Janie read Design Thinking for the Greater Good: Innovation in the Social Sector by Jeanne Liedtka, Randy Salzman, and Daisy Azer and considered the impact that empathy can have when we’re trying to solve problems. 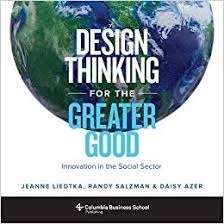 Last month I was perusing our book shelf looking for my next blog subject and decided to pick up Design Thinking for the Greater Good: Innovation in the Social Sector by Jeanne Liedtka, Randy Salzman, and Daisy Azer. I was lucky to work with Jeanne for almost seven years at the University of Virginia Darden School of Business and always enjoy reading her research. Design Thinking for the Greater Good includes ten stories of how different organizations used design thinking to further innovation. One of my favorite stories is about Marliza Rivera who oversees performance improvement at Whiteriver Indian Hospital. Rivera wanted to help her hospital reduce wait times in the emergency room (ER) and she had an idea for an electronic kiosk, inspired by a similar system she saw at a busy ER in Baltimore. When Rivera began exploring the opportunity as part of an innovation program, she was convinced that a kiosk was the right solution and believed that no one could change her mind. However, one of the key teachings of design thinking (and one of the first things Rivera learned in the program) is the notion of challenging your assumptions. Rivera and her colleagues were encouraged to use empathy to see things from the perspective of the patients they were trying to help. Rivera thought about what her 86-year-old grandmother would think of an electronic kiosk to greet her when she arrives at the ER. She realized that many of her hospital’s patients would not be comfortable with this new technology and that a kiosk was likely to make things more complicated. After conducting research with current patients to help her understand the problem, she came up with a different solution. Rivera implemented a system where an experienced physician would have a brief interview with each patient consisting of a series of short questions that helped the hospital separate patients with basic medical concerns from patients with real emergencies, in order to direct each patient to the treatment they needed. It cost the hospital approximately $150,000 to implement the new process into emergency department; this redesign led to a savings of almost $6,000,000. This was an interesting story and I realized how important empathy was in helping Rivera come up with a better solution for her problem. If Rivera and her team hadn’t forced themselves to think about patients’ points of view, they would likely have moved forward with the electronic kiosk in the ER. When they took the time to interview some of the patients, they realized a kiosk wouldn’t be a good solution because the patients wouldn’t be comfortable using the system. Empathy was key to hearing the patients’ needs and understanding how to make things better. As I read this and other stories, I found myself reflecting on the importance of empathy in a variety of situations. I realized that it can be really useful when I’m preparing for a difficult conversation. Having empathy for the person I’m speaking with and trying to understand where they are coming from helps me to be a better listener. I sometimes have a tendency to focus on my desire to be “right” and I have to let go of this if I’m going to really hear what the other person is trying to tell me. I enjoyed reading all the stories in this book and my key takeaway was the importance of empathy for the people you are working with. What are some ways you could use empathy to achieve a better solution to a difficult situation?